Using the latest 3-D laser scanning and advanced graphic techniques, "Tales of the Maya Skies" takes audiences on a journey back in time to the jungles of Mexico to Chichén Itzá and the world of the ancient Maya. In a story that weaves together a rich combination of Mayan science, culture and legend, we learn how the Maya were able to make sense of an ever-changing world and through their extraordinary understanding of mathematics and astronomy, to predict events far into the future -- even to 2012. 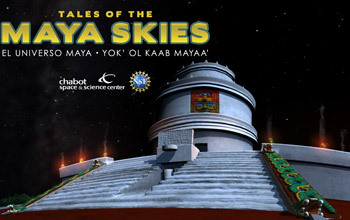 Produced by Chabot Space & Science Center with major funding from the National Science Foundation, "Tales of the Maya Skies" is an immersive full-dome show featuring an original score by Michael Stearns, and narration by Latin Grammy Award winner Lila Downs. Learn more about "Tales of the Maya Skies" at http://mayaskies.org/ and at http://www.chabotspace.org/maya-skies. Fels Planetarium, Franklin Institute, Philadelphia, Pa.
Frederic Ching, Hartnell College, Salinas, Calif.
Gladwin Planetarium, Santa Barbara Museum of Natural History, Santa Barbara, Calif.
Pensacola State College, Pensacola, Fla.